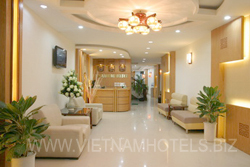 Baamboo Hotel, 5B Nguyen Sieu Street, Hoan Kiem, Hanoi, is located near Hoan Kiem Lake, the heart of Hanoi, one street from St. Joseph’s Cathedral in an area offering a wide choice of excellent Western style and Vietnamese restaurants. On the edge of Hanoi’s Old Town of Thirty-Six Streets, the hotel is surrounded by colourful shops selling silk, lacquer, wood and stone sculpture, one block from Hanoi’s Silk Street, Hang Gai. From breakfast to lunch, dinner or a tasty little snack, Baamboo Hotel provides balanced service 24/7 at all its hotels. At Baamboo Hotel, you can count on enjoying a relaxing meal in a friendly, stylish setting.